A highly respected human and civil rights lawyer, who recently spoke out against human rights abuses of Chinese citizens who practise Falun Gong, has received strict orders from Chinese authorities to close his Beijing practice for one year. 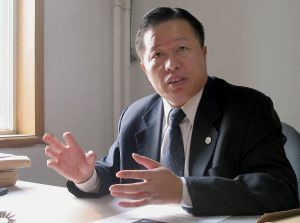 Mr Gao Zhisheng, head of the Zhisheng legal office, explained that he had been investigating the persecution of Falun Gong and found evidence of extensive human rights violations. He told AFP that evidence of torture prompted him to write an open letter to Chinese President Hu Jintao and Premier Wen Jiabao calling for an end to the six-year persecution of the Falun Gong spiritual practice. His letter, written last month, was met with demands from Chinese officials that he officially withdraw his request. Mr Gao explained that Chinese Communist Party (CCP) officials met with him on several occasions. However he was unwilling to retract his formal request to the Government to stop the brutal persecution. The lawyer’s refusal to “take back” his open letter was then followed by the notification by officials that his legal firm was to stop operating for a year. “I was notified by the justice bureau yesterday that we have to stop operating for a year,” Mr Gao Zhisheng told AFP. Mr Gao explained that he was also concerned about the likelihood of infringements against his personal freedom. “If I don’t abide by this within a year, my personal freedom is likely to be restricted,” the 41-year-old lawyer said. The Chinese authorities banned Falun Gong, a peaceful practice of mind and body, in 1999 due to its extraordinary popularity. The practise was first introduced to the public in 1992, and within a short time millions of Chinese citizens took up the Falun Gong teachings, including numerous CCP members. Mr Gao has earned a reputation for his courage to stand up against human rights abuses, which are considered politically sensitive in China. One of his recent cases includes the ongoing legal fight for the release of Cai Zhuohua, an underground Christian pastor sentenced to a seven-year jail term. Due to the repercussions of using the legal system to fight against human rights abuses committed by the CCP, Mr Gao is one of only a handful of Chinese lawyers who has continued to legally represent victims of spiritual persecution in China.